Is my coconut oil still OK to use if it turns to a liquid? Yes. Coconut oil is solid at 76 degrees Fahrenheit and turns to a liquid consistency in higher temperatures. If you would like the liquid to turn solid again, simply place it in the refrigerator. Although the form may change depending on the temperature, the quality of the oil is not affected. Use this Golden Barrel 32 oz. coconut oil in place of butter, shortening, or other cooking oils for a variety of cooking and baking applications! Coconut oil continues to be on the rise for its versatility and excellent performance, and you can use it for many menu items, from traditional to trendy. With its high smoke point of 400 degrees Fahrenheit, it's a great choice for frying. Use it for freshly-popped popcorn at your concession stand, or use it to help make dairy free or gluten free baked goods at your restaurant or bakery! Coconut oil has been found to improve one's general health and wellness, including boosting immunity, and it's less greasy than using butter. Since this coconut oil has been refined, it is tasteless and odorless, so it won't impart any unwanted flavors into your most popular foods. It is also non-hydrogenated, meaning that it is naturally trans fat free. This coconut oil features no added preservatives and has a solid consistency when stored below 76 degrees Fahrenheit. Stock up on this easily accessible 32 oz. container and discover the many uses of this Golden Barrel coconut oil! This item does not contain any milk-based ingredients. This coconut oil is a crowd favorite! It's a perfect way to make sure that you have all the oils on hand that customers want. I love using this coconut oil in chocolate sauces and other desserts. It is a great quality and it came triple sealed and there were no leaks or breakage upon arrival. would highly recommend! 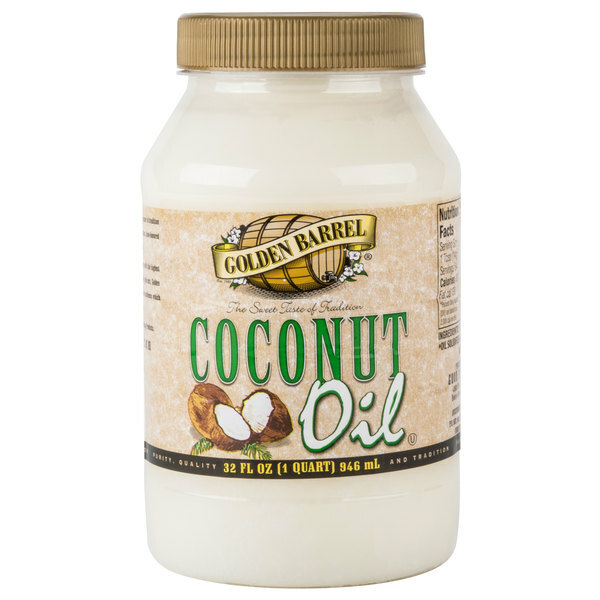 Golden Barrel Coconut Oil is a good choice if you need a dairy-free alternative for baking. I've used it to make scones and they were delish! And since it's refined, there's no coconut taste or smell. I even use it to season my cast iron pans. A great product at a great price. I love the healthy benefits of coconut oil! It is so pure and makes all my dishes better. I bought this product thinking it was like the others I have tried boy was I wrong! The consistency is perfect! That’s right it was a great product at an awesome price! Thank you WebstaurantStore! This is a great product at a great price. Works in place of butter in most applications, which makes the vegans happy. We love it. So excited to have found plain coconut oil! This product is all the rage these days and for good reason. It is healthier and works wonderfully as an alternative to the blended oils. It also can be used for both high and low smoke points which is a huge plus. Great price and great product. We use coconut oil in a lot of our baking and cooking. It sautés vegetables and goes into cakes and cookies without leaving an aftertaste. This quart size jar is a great value- nearly half the price of our previous supplier. The golden barrel coconut oil is great for my skin. The oil is very nutrient rich and great for my dry, cracked hands during the winter season. I learned that coconut oil is one of the two “secret” ingredients used in movie theatre popcorn (also Flavacol). You don’t need a lot- one tablespoon of oil is enough for 1/2c of unpopped kernels. Normally, I cannot stand coconut, but since this is a refined oil, there’s no unpleasant tropical flavor. Just delicious popcorn at home! Bonus: This was twice the oil at half the price I’ve seen in supermarkets. I love using coconut oil for everything. I use it in my oatmeal, granola, I've made ganache and tarts with it, it's a must have in my kitchen. 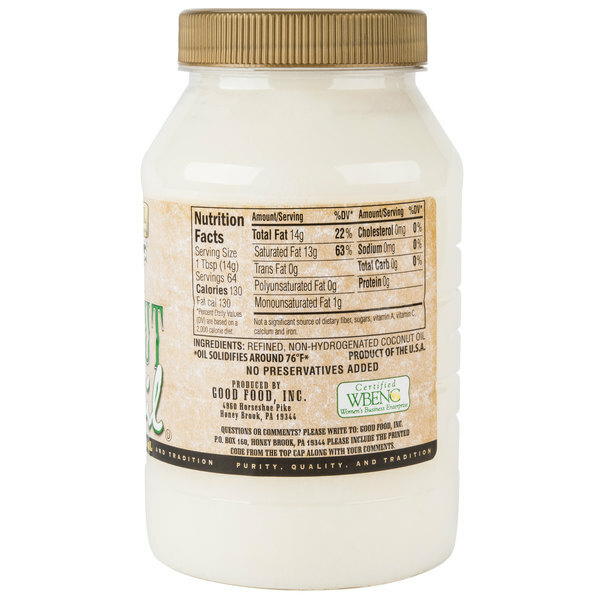 Awesome value on this 32 ounce coconut oil. We love this for baking, frying, and especially popcorn. High smoke point, non hydrogenated, and non gmo makes for a healthier oil for your customers or self. I'm very weirded out by this oil...It's completely liquid at room temperature, even when my other coconut oil (which is just from the grocery store) is mostly solid. It seems rather fake and unnatural, more like vegetable oil than coconut oil. Coconut oil is solid at 76 degrees Fahrenheit and turns to a liquid consistency in higher temperatures. If you would like the liquid to turn solid again, simply place it in the refrigerator. Although the form may change depending on the temperature, the quality of the oil is not affected. If you have any further questions, please contact our Customer Solutions team! Golden Barrel 32 oz. Coconut Oil is a delicious and healthier alternative to say corn, vegetable or even canola oils for cooking and baking abd out didn't give off an offensive coconut scent or taste thankfully. If you need good quality coconut oil in bulk this is a really great way to go. it tastes good and comes at a great price. it's nice to be be able to find it here and not have to pay much more at the store. This is a good alternative to traditional oils/fats for cooking. It has no flavor, so you don't have to worry about everything tasting like coconut, and it has a very high smoke point, which makes a useful for frying. We started making our own popcorn at home. I have an air popper to keep it healthy, but sometimes we want a bit of flavor. 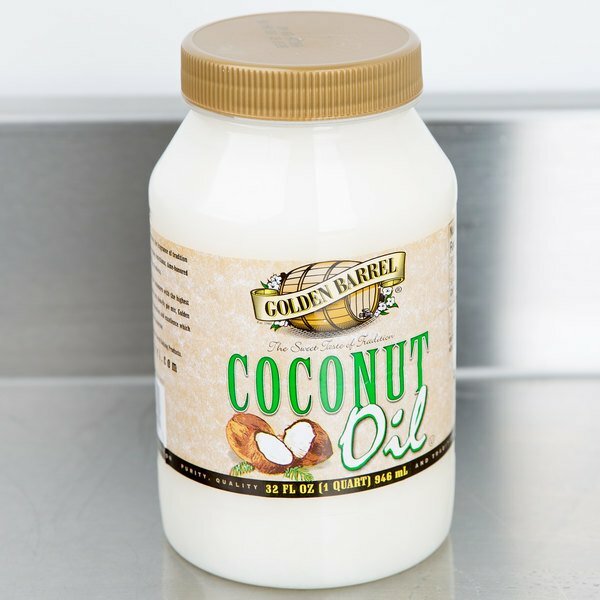 We use this coconut oil to make our popcorn on the stove top and then add Webstaurants flavored popcorn salts and glazes to the oil along with the kernals. It’s so easy to make and it tastes just like the movie theater and carnival popcorn. Since this is refined oil, you don’t taste the coconut flavor at all…it just brings out the flavors of what you’re using. The answer to everything in life is coconut oil. I use it for cooking, I use it for my hair, I just absolutely love it and I cannot believe what a great price it is on here! These 32 oz. jars are the perfect size for use at events... small enough to keep handy by the popcorn machines, with wide openings to scoop from. Will order again! This is really good Coconut oil. I use it for everything... moisturizer, cooking, hair mask, you name it! I am very glad it comes in such a large size. This coconut oil is such a good quality for the price. I use coconut oil in my food and for my body oils and i love the idea of not spending so much money on it. This is good coconut oil for a great price! We use it in our cupcakes and cakes, it doesn't give an overpowering coconut taste like some. We will be purchasing again. Great oil to use when popping popcorn or for other uses. Please note it is solid at room temperature, but does melt around 91 degrees. This is a good coconut oil. It will not make your food taste like coconut. It is very good for use in cooking and baking. this is a wonderful product for both crafting (bath bombs!) and cooking or baking. there is not a strong odor or flavor but can be used for so many practical daily uses. for the size, this was a great value and will continue to purchase this item time and time again. We use this oil for cooking and soap making, it does justice to our soaps and we run out quickly, going to order the bigger jars. Love it , The website and the coconut oil as well. It's so rich and thick , so good for beauty and health , also love the price! It is a great smaller coconut oil that can be stored for later. Good quality brand. Not strong flavor, no taste really which can be great. I could go on and on about how much I love this stuff. It's truly a miracle oil. I use it for health and beauty, nutrition, and cooking. I was so happy to stumble across Golden Barrel White Coconut Oil. It has numerous uses and I love that it is tasteless. I've gotten some coconut oils in the past that were good, but they always imparted coconut flavor. This one does not. It simply serves as a great, healthy cooking oil.